On April 10th, the NNLM New England Region (NER) hosted the New England Graphic Medicine ComicCon at the University of Massachusetts Medical School in Worcester. The conference kicked off with keynote speaker, and current NNLM Reading Club Kit author, Rachel Lindsay. Rachel presented Reclaiming Patient Narrative Through Graphic Medicine, and discussed her life story that led to the creation of RX: A Graphic Memoir. You can find out more about RX by applying for a reading club kit containing Rachel’s book. One of the panelists, Maki Naro, is a self-proclaimed illustrator, science communicator, and nerd. Maki talked about Creating Science Comics: Communicating Big Ideas in Small Panels. In 2014, Maki’s comic Vaccines Work. Here are the Facts was published on his website. TheNib.com is a site that “looks at what is going down in the world, all in comics form.” Vaccines Work remains one of the site’s most relevant and popular posts as measles and whooping cough outbreaks continue around the nation. Other sessions included collection management, course and program design, and a case study of a cartooning project connecting migrant dairy workers in Vermont with cartoonists to document mental health issues associated with trauma and isolation, El Viaje Más Caro / The Most Costly Journey. 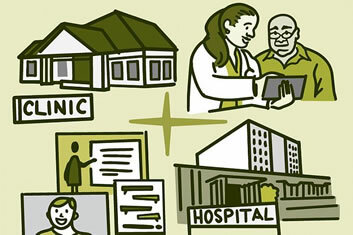 NER is leading the way in supporting graphic medicine as a means of communicating the NNLM mission. This conference was a great jumping off point. PSR members can apply now for several graphic medicine titles in our reading club kits, and watch out for more graphic medicine tie-ins in the near future! In early 2018, I secured a spot in the National Network of Libraries of Medicine’s inaugural RDM 101: Biomedical and Health Research Data Management Training for Librarians, conducted by the National Training Office (NTO). I learned quite a bit about research data management (RDM) during the eight-week online course. At the time, I was the Health and Nursing Librarian at the University of Southern Mississippi, and I wrote about my RDM 101 experience in a post on the Southern Chapter’s blog, Southern Salutations. I have since moved into my current position as the Health Sciences Librarian at the University of Nevada, Reno (UNR), but I remain intensely interested in developing a robust RDM program. During the first week of April, I visited the University of Cincinnati (UC) for a few days, also courtesy of the NNLM NTO. I attended UC’s 4th annual Data Day and had the opportunity to learn about the University of Cincinnati Libraries’ data initiatives in the meantime. Amy Koshoffer, UC Science Informationist and a RDM 101 course mentor, graciously served as my host for the trip. Rebecca Morgan, librarian at the University of Louisville, also attended. It was nice to have a “buddy” who was there with similar aims. Data Day was a bit different than what I’d expected, but in a good way. Before studying the schedule, I had imagined it would be almost entirely hands-on skills development – the “how” of research data. And while the event featured a power session that introduced participants to the R programming language, most of the day’s sessions focused instead on the big picture of research data – the “why.” Drawing in over 100 attendees, Data Day serves as a community building venture for those interested in data and data issues at UC and within the region. This year’s theme was Diversity, Equity and Inclusion in Data. Keynote speakers included Amanda J. Wilson, Head of the NLM’s National Network Coordinating Office, who presented on the All of Us Research Program, and Debra Guadalupe Duran, Director of the National Institute on Minority Health and Health Disparities, who discussed big data’s impacts on health disparities. I would ultimately like to host a similar, albeit smaller, event here at UNR. My co-workers and I are brainstorming ways we can support RDM and data science skills development on our campus. Amy and her colleagues emphasized educational activities as a starting point, e.g., tailored workshops based on the New England Collaborative Data Management Curriculum, and described how they came together to create a strategic plan and a set of goals for data at UC. Rebecca also noted how her library has established a similar sort of group. Since my return, we’ve made plans to establish a data working group within the UNR Libraries. We already have a LibGuide, a Canvas module available to all faculty and staff, and have led a few workshops on RDM. But we’ll use UC and others as a guide when developing our own goals in this area. Not everything I encountered or heard about at UC is applicable or achievable at UNR – at least not immediately. But I feel a lot more confident that we’re on the right track with RDM and data science. Over time, some of the distinctive aspects of UC’s program will find their way into our work at UNR. Starting small and planning on a “slow burn” is perfectly okay! Moreover, visiting other campuses and their libraries is invigorating, as is meeting colleagues who are interested in the same topics and issues as you are. Apart from Rebecca, I also met librarians from Miami University (in Oxford, OH) and the University of Kentucky who attended Data Day. Now I have a handful of fellow librarians that I can easily reach out to when an interesting data-related idea springs to mind or when planning a data-related activity or event. Although I’m not adverse to cold calling other librarians who I’ve noted are doing interesting activities, it is great to have built a rapport with specific individuals within the NNLM and RDM communities! This was also one of the primary benefits of the RDM 101 course itself. Join the National Library of Medicine for a webinar to answer questions about the LinkOut Consolidation Announcement. A 15-minute presentation will review what this consolidation means for libraries, and how to continue to see your library’s icon in PubMed. Following the presentation, there will be a 30-minute question and answer session with LinkOut experts. This webinar is aimed at librarians whose institutions currently have a LinkOut for Libraries service set up. The webinar will be hosted twice with the same content to allow as many participants as possible. After the live presentations, recordings will be available on the LinkOut for Libraries Training and Educational Resources Web page and in the Learning Resources Database. My Bibliography is an application developed by the National Library of Medicine to help organize citations to your publications and to assist eRA Commons users with managing publication or product compliance with the NIH Public Access Policy. My Bibliography version 3.0, the redesigned and rebuilt new version to be released soon, includes useful new tools and a streamlined interface that facilitates a workspace to quickly view publications’ compliance status, initiate submissions to the NIH Manuscript Submission system (NIHMS), and organize publications and awards data using the new searching, filtering, and sorting options. To see a series of illustrations previewing the new interface, visit the NLM Technical Bulletin. There is an additional article with more information for eRA Commons users. My Bibliography’s streamlined interface displays options to manage citations, add citations, search, and sort at the top of the page. The unique URL to share bibliographies with others is also found at the top of the page. There are three options to add author-specific article citations: using the My Bibliography citation search tool to find citations in PubMed, uploading citations from a file, or using My Bibliography templates to create citations manually. Citations stored in My Bibliography can be downloaded in MEDLINE format by checking the boxes next to the citations to include in an export file and selecting the option “Export file (MEDLINE)” in “Manage citations.” Citations can be sorted by author name (either in ascending or descending order), by publication date (newest to oldest or oldest to newest), or by recently updated citations. Locating citations can be accomplished by entering article PMCID, citation PMID, article title words, author name, DOI, or journal title in the search box. Citations stored in My Bibliography can be shared with others using the personal URL displayed at the top of the page. The public version of My Bibliography displays all the citations currently stored in your bibliography. After traveling across the country for three years, the NLM traveling exhibit Pick Your Poison: Intoxicating Pleasures & Medical Prescriptions arrived in Southern California. From March 27 to May 3, students and library users will be able to enjoy this nicely done exhibit at the Santiago Canyon College library in the city of Orange. This exhibit explores the use of tobacco, alcohol, opium, cocaine and marijuana in the history of America. It demonstrates some of the factors that have shaped the changing definitions of some of these mind-altering drugs from medical miracle to social menace. The exhibit was developed by the National Library of Medicine and National Institute of Health, and was curated by Dr. Manon Parry, Professor of Medical History at the Vrje Universiteit, Amsterdan, and Senior Lecturer in American Studies and Public History at the University of Amsterdam. The archived recording of the March 27 session for the NNLM collaborative webinar series, NNLM Resource Picks, is available. The topic is ToxTutor, a self-paced tutorial covering key principles of toxicology for users of the National Library of Medicine (NLM) chemical and toxicology databases. The webinar is presented by Dr. Pertti (Bert) Hakkinen, the Senior Toxicologist and the Toxicology and Environmental Health Science Advisor at NLM. View the webinar by clicking on the YouTube video player below. Some kids get tonsillitis, or infected tonsils, again and again. A new study found that strep, a germ that causes tonsillitis, can trick the body’s immune system. Health Capsule: How Much Alcohol Is Too Much? Many people don’t realize that their drinking habits could be a problem. Find out how risky your drinking is with NIH’s “Rethinking Drinking” interactive website. Learn about different mental health topics, such as eating disorders, suicide prevention, and traumatic events and find out how often mental health conditions occur. To help with this transition, every LinkOut account will receive an email notice. A list of frequently asked questions is also available. Additionally, NLM staff will hold a webinar in April about these changes to LinkOut for Libraries and answer questions about the transition. Details about the webinar will be announced soon. Questions about this process may be directed to the NLM Support Center.